The photograph was taken after the Celebration Service at the Cathedral on Saturday 14 July, for the 40thAnniversary of the Link between Zambia and Bath & Wells Diocese. On 22nd July we welcomed Fr Rogers and Esther Banda to St Cuthbert, for a Service for the Zambia Link. During July, a group of six young adults from Zambia with Fr Robert Sihubwa (Zambia’s National Youth Officer) visited the Diocese of Bath and Wells for 10 days. 29 August: The Wells Junior Football Club, having been given new colours, had offered their old football strip to Wells Rotary for a good cause. The problem of sending them to Livingstone was solved when a choir from Lusaka Diocese, due to sing in St Thomas' Church, agreed to take the strip back in their baggage. This was done, and on 2 November we heard that Fr. Yobo had collected them from Lusaka. Great thanks to the choir, which also sang beautifully. Fr. Yobo distributing the football strip. Since the 2013 report below, under the able leadership of Lynn Rendell as Link Correspondent, we have continued to support Father Chikoya and the Parish of West Livingstone. Now, however Lynn is passing that role on to Jane Savery, who visited Zambia and the Parish earlier this year - some photos are shown below*. Jane marked her accession with a presentation of her visit to parishioners at a very successful coffee morning on 6th June, and we look forward to learning more about our linked Parish in the future. We have facilitated the donation of assorted items such as books, stationery and soccer boots through a Swindon link with Mahululo Community School on the outskirts of Livingstone. The fuel used for this trip on 29th May was funded from the Parish Link. We have donated solar power units to Natebe Community School via 'Lights for Learning UK'. We donated mealie meal and clothes to Lubasi Home for Orphans and Vulnerable Children, through the Anglican Men's Union and Sunday School, on 30th May. 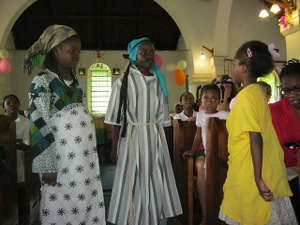 We had Sports Day for youth on 25th May. We are building a block of small shops for rent to diversify our income and ensure that the church has an alternative source of income to sustain its operations. We assisted a vulnerable family with money to build a toilet at their house, courtesy of the Link Parish funds. We have offered school fees support to needy children. Overall we run the cross malaria initiative in Livingstone, Sesheke, Mongu, Kazungula and surrounding areas. 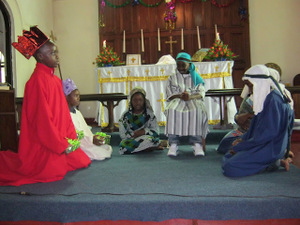 St Cuthbert's is linked to the parish of Livingstone West, Zambia. We hold concerts and events during the year, the proceeds from which go our link parish and to help support the Livingstone Anglican Children's Project. 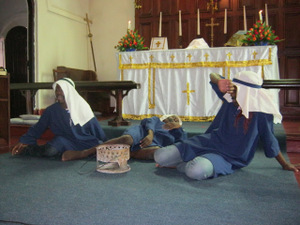 On 20th January 2013 St Thomas, Wells launched their Link with the Parish of East Livingstone in Zambia in a joyful and uplifting service. Jenny Humphreys, the Diocesan Advisor spoke and the service was followed by a Zambian Lunch! There was previously just one Parish of Livingstone to which St Cuthbert's was linked with Father Emmanuel Chikoya as their priest. You may have met him when he visited St Cuthbert's in the summer of 2011; at that time he spoke about the division of the Parish which took place in June 2011. Father Boniface Baleni is the priest for East Livingstone, which comprises St Augustine's Church and St Monica's in the suburb of Ngwenya. St Cuthbert's continues to be linked with West Livingstone Parish under the leadership of Father Chikoya comprising St Andrew's Church, St Stephen's at Dambwa (to which we made a donation for the building of the roof some years ago now) and St Simon's church out at the Airport. The churches report that dividing the Parish has proved very helpful in improving the spiritual teaching, preaching and pastoral care of the Parishes as there are now two priests to share the load. The various church groups include the very active Mother's Union, St Veronica's group, Men's Union (now called the Anglican Men's Association) and Praise Team. 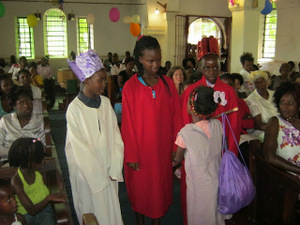 As well as Sunday Services there are also bible study groups and mid-week prayers. The Parish is hoping to encourage the growth of Boys' and Girls' Brigades. 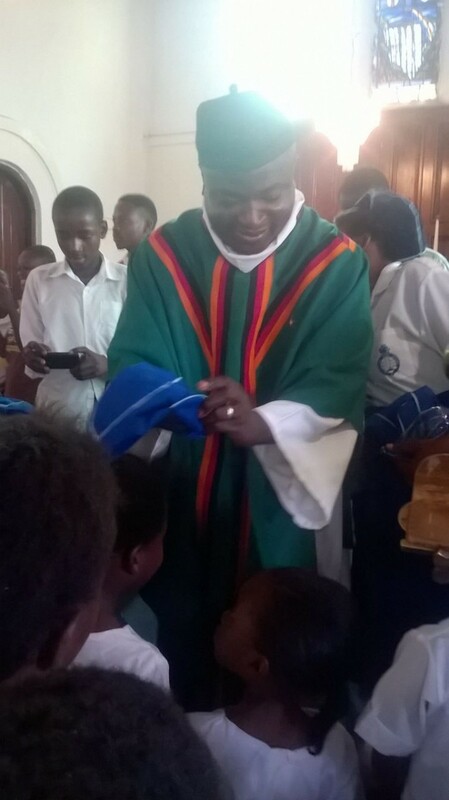 Father Chikoya continues to be Director of the Livingstone Anglican Children's Project which is based in both Ngwenya and Dambwa helping children who have been affected by HIV/Aids with monthly feeding programmes, psycho-social support and a programme to reduce child labour. Last year St Cuthbert's raised about £200 which Father Chikoya said he will put towards the work with the young people in the Parish which has been languishing recently, and for which they would appreciate our prayers. We remember however that our link is not just about giving money but supporting each other in prayer and learning from each other. Livingstone itself is a very busy town and tourist resort being so close to the Victoria Falls. The Parish there is very pleased to be linked with St Cuthbert's, and continues to pray for us here in Wells. They and Father Chikoya send their good wishes to us.